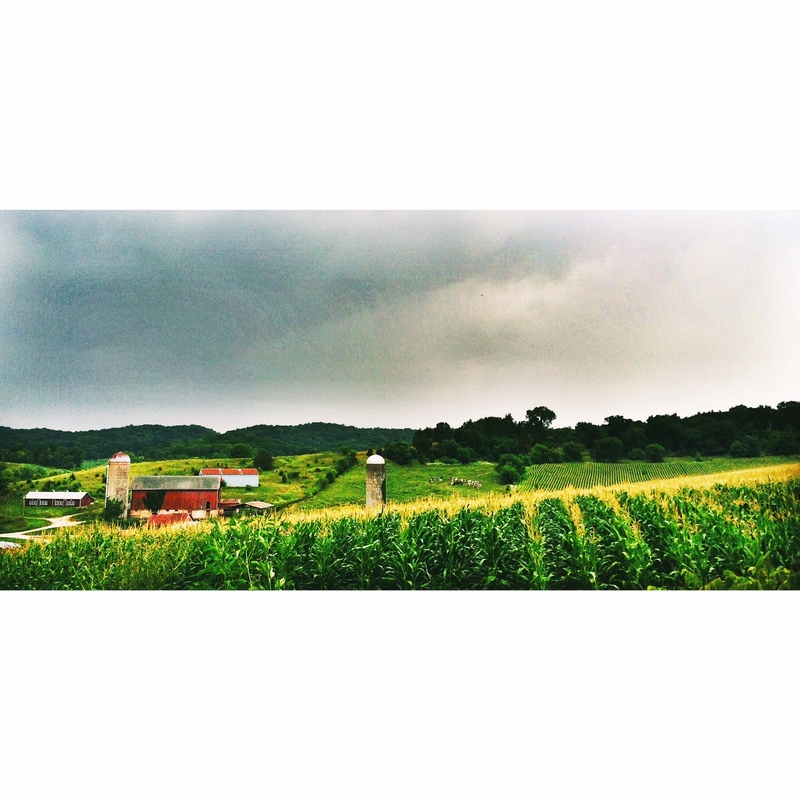 Some days on the road are magical. 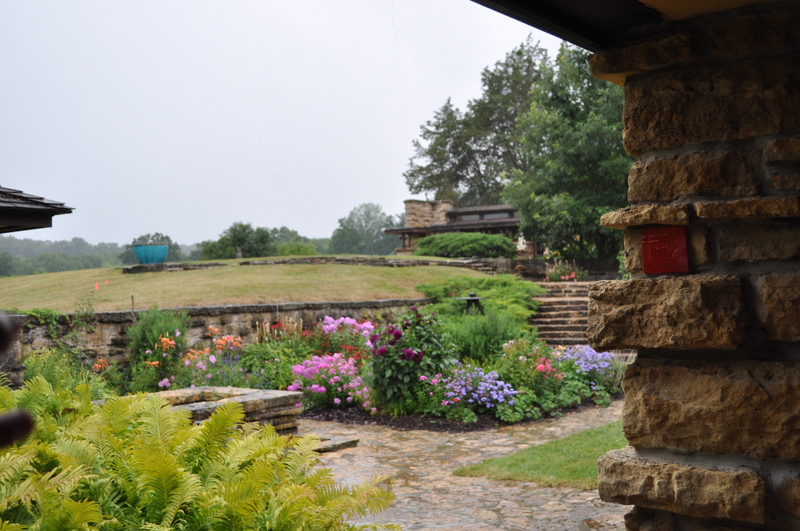 Yesterday – spent at Frank Lloyd Wright‘s Taliesin – was one such afternoon. Our cross-country road trip includes a couple of places that are clearly what one could tag as a busman’s holiday. 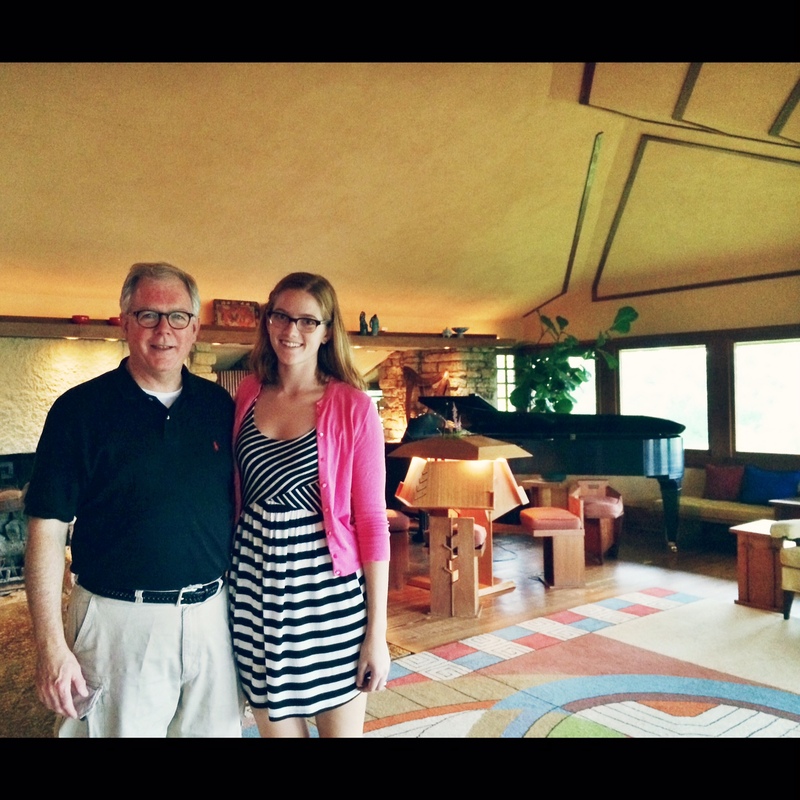 Thanks to the generous offer of my good friend Jeff Grip of the Frank Lloyd Wright Foundation, Claire and I were met at Taliesin – Wright’s Spring Green, Wisconsin, home – by Effi Casey, a member of the Taliesin Fellowship; a graduate of the architecture school at Taliesin; the widow of the long-time dean of the Frank Lloyd Wright School of Architecture, Tom Casey; and an accomplished violinist who serves as the Director of Music at the school. We were also joined for the afternoon by Floyd Hamblen, a member of the Taliesin Fellowship who serves on the faculty of the Frank Lloyd Wright School of Architecture, is a practicing architect, and lives year-round with his family at Taliesin. I’m pictured with the two of them inside Effi’s home on the grounds, known locally as the Engineer’s House. We were later joined in the main house by Victor Sidy, the current dean of the School of Architecture. Having the opportunity to be with three such accomplished, yet humble, individuals who wanted nothing more than to ensure that we had the chance to see and understand Wright’s vision of Taliesin made a lasting impression on both of us. As we drove off more than three hours later, my lovely Claire said, “Dad, they even talked to me throughout the afternoon, and they were interested in what I was doing, not just in talking preservation with you. 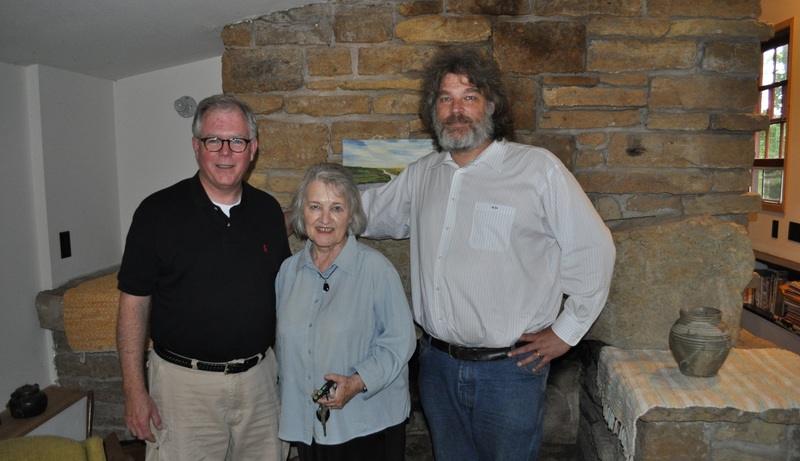 But what they had to say about Taliesin was so interesting, I loved it.” Effi, Floyd, and Victor all were so gracious with their time, knowledge, and perspectives. When we first sat down in the dining hall of the studio building, Effi began by saying, “I read your recent posts on the future of preservation, and I like where you are going with those writings. So much of preservation is stuck in the past, but your emphasis on people in preservation and the thought that the ‘period of significance is now’ rings true.” That was just the start of an afternoon of thoughtful conversation. 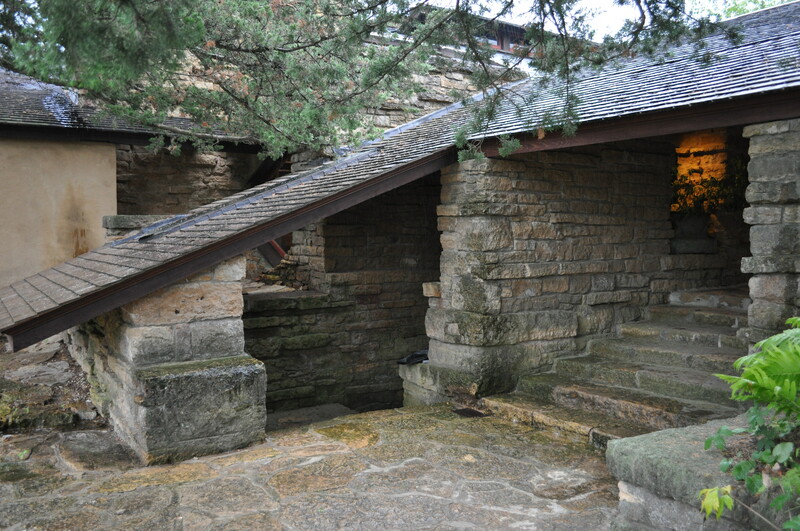 Taliesin was the home of architect Frank Lloyd Wright. He first designed the home for himself in 1911. From that time until his death in 1959, Wright continuously changed the home and the surrounding landscape, which included buildings that he had designed for his family. 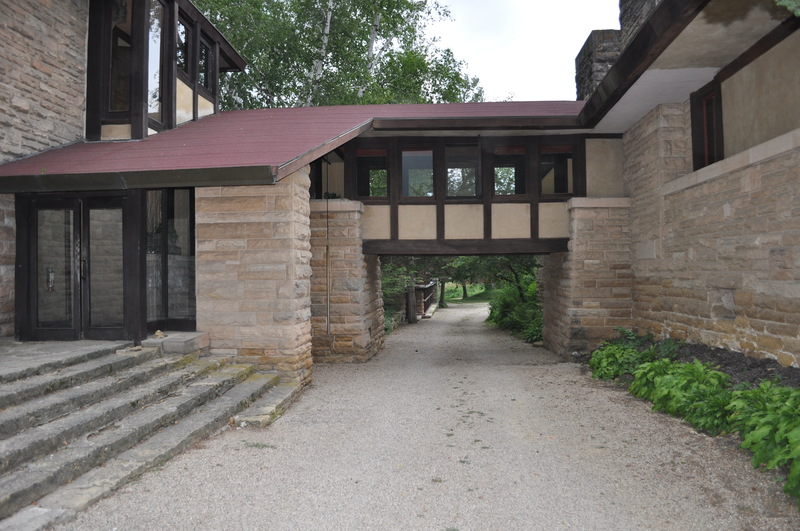 At the time of Frank Lloyd Wright’s death, “Taliesin” referred to the home, the surrounding 600-acre estate, and 4 other Frank Lloyd Wright-designed structures. 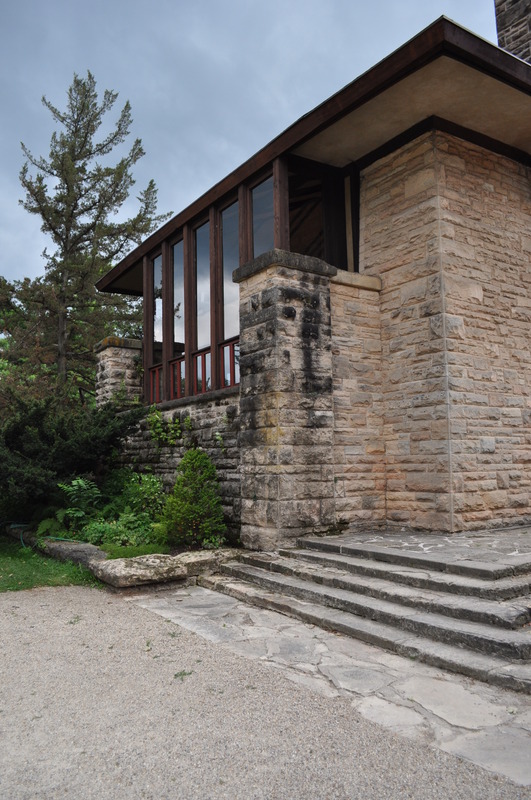 Having heard of Taliesin for years, visiting this iconic National Historic Landmark that has a thriving present and a future as visionary as its past was more than just a bucket list check-off while on a cross-country trip. 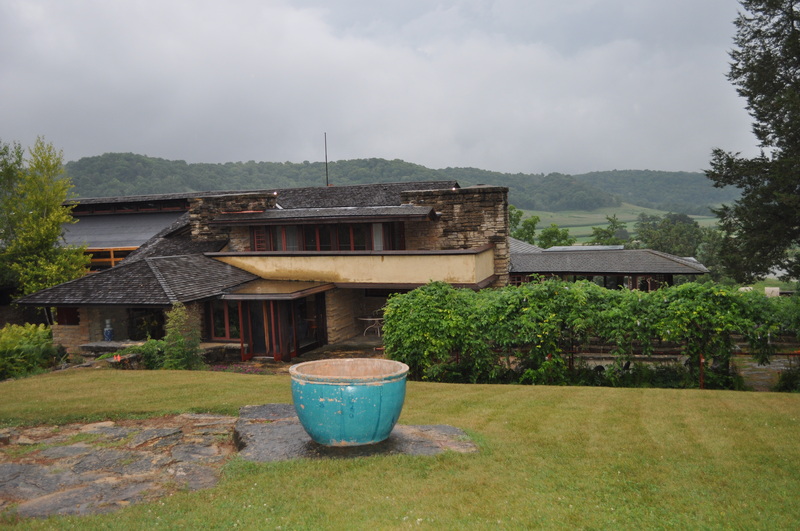 Understanding the philosophy behind Taliesin’s educational purpose and preservation, and then seeing it in practice, has already started wheels turning in my head about work we do at the National Trust, both at our historic sites and with our National Treasure campaigns. But I won’t go into that here, other than to say I love how the stewards of this place are all working – through their own understandings of the way forward – to continue its use as a thriving, alive, and purposeful place for the future. Those who tour Taliesin are not allowed to take interior photographs, and out of respect for that policy I have only posted two interior photos – the one above in the Engineer’s House and one below taken by Floyd Hamblen of Claire and me in the living room of the main house at Taliesin. There are plenty of interior views online for the curious. 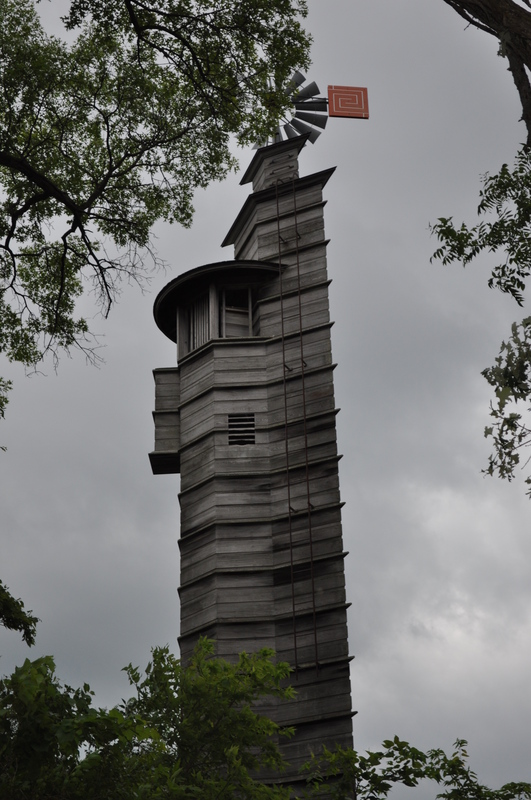 In addition, it was a gray, windy, and occasionally rainy afternoon, so these are photos best understood in that light. After a wonderful tour of the theatre, drafting studio, and dining hall, we drove up to the Engineer’s House – where Effi opened her home to us – and we also toured the recently restored Tan-Y-Deri. 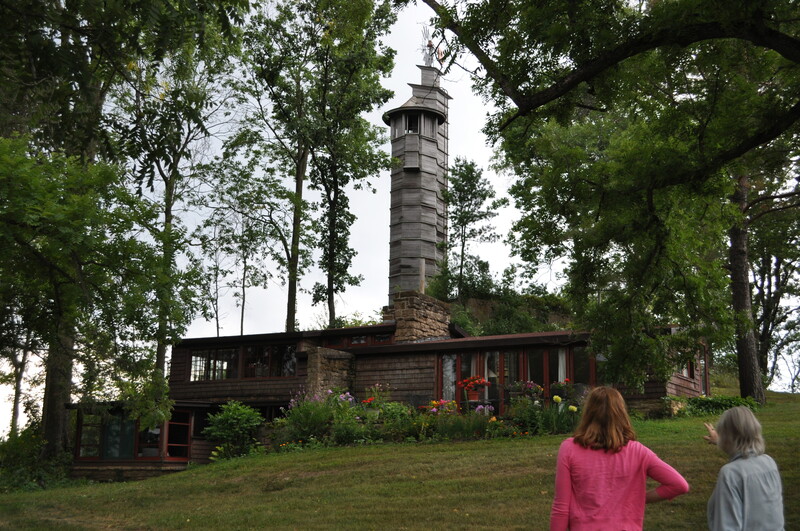 Wright’s “Romeo and Juliet Windmill” makes for a unique rural backdrop to these two homes. Finally, we ended our day at the main house. 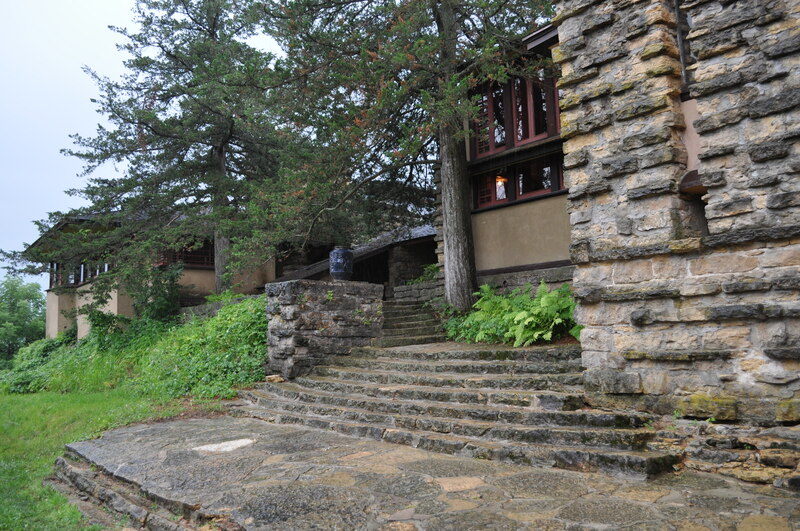 When Wright designed his own home, he gave it the Welsh name Taliesin, meaning “shining brow.” Frank Lloyd Wright placed Taliesin on the brow of a hill, leaving the crown, or top, open – as you can see in the next two pictures. We toured throughout the main house, seeing the variety of preservation projects underway. And finally, we ended on the brow of the hill, looking at the exterior – and the view. There is so much more to see and say…but this will have to do in whetting your appetite. 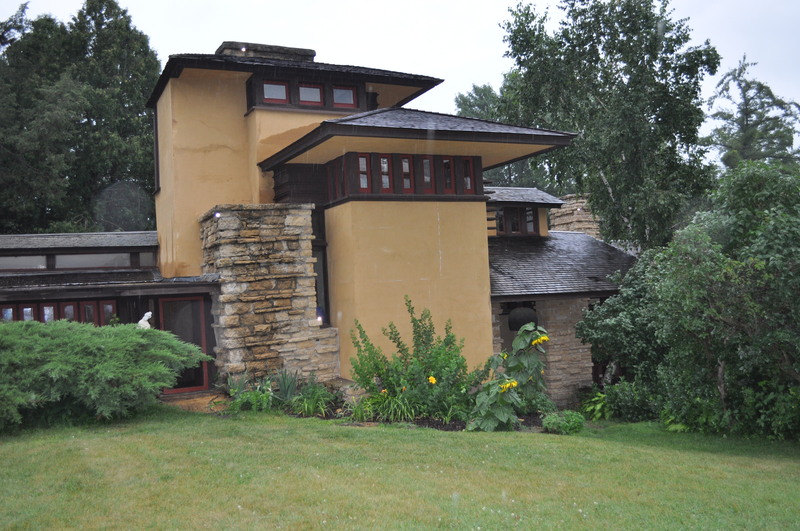 Taliesin is about 3 1/2 hours from Chicago and less than an hour from Madison. Don’t wait as long as I did to see it. 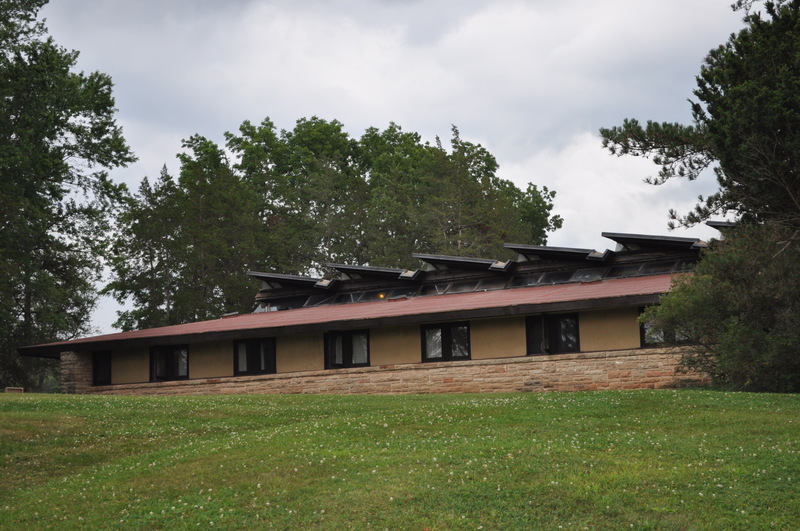 Thanks again to Jeff, Effi, Floyd, Victor, Taliesin Preservation, Inc., the Frank Lloyd Wright Foundation, the Frank Lloyd Wright School of Architecture – and everyone who helps this wonderful place stay fresh and alive. Previous PostYou Want Nutrition, Eat Carrots!